In 1916, both the British and the French introduced tanks on the battlefield and gradually improved their performances and design through frontline experience. But still, even by 1917, the German high command still considered they could be defeated by using special rifle bullets and artillery, in direct or indirect fire. The impression they had was mixed, seeing their breakdowns and apparent difficult crossing of the heavily cratered no man’s land. But the psychological effect on an unprepared infantry was such that this new weapon had to be seriously taken in consideration. 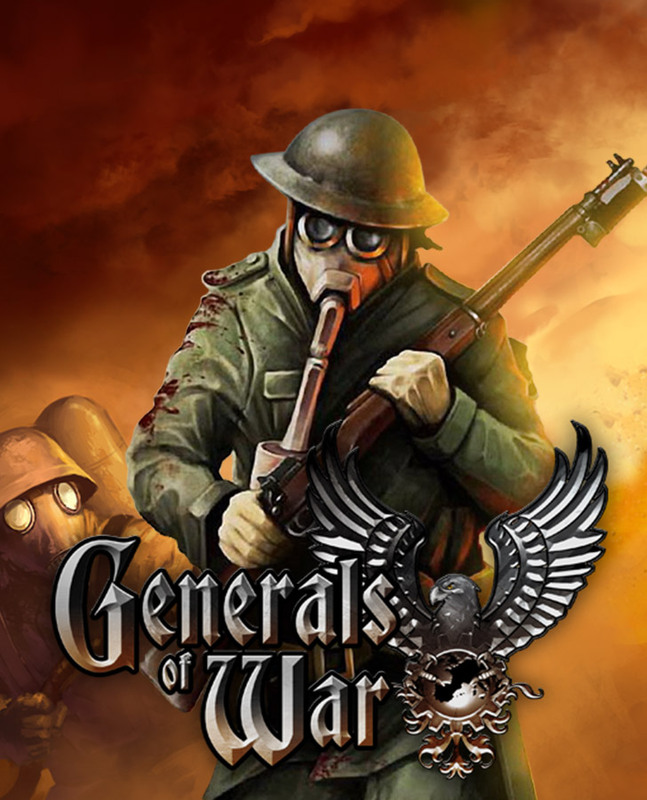 The traditional view still prevailed, seing infantry as the most versatile way to make a breakthrough, notably the famous elite “assault squads”, or “sturmtruppen”, equipped with grenades, small arms and flame-throwers. They proved successful during the spring offensive and further hampered the need for a tank. This Department was responsible for all the information gathering on Allied tanks and for formulating both anti-tank tactics and devices and specifications for a possible indigenous design. Based on these specifications, the first plans were drawn by Joseph Vollmer, a reserve captain and engineer. These specifications included a top weight of 30 tons, use of the available Austrian Holt chassis, ability to cross ditches 1.5 m (4.92 ft) wide, to have a speed of at least 12 km/h (7.45 mph), several machine guns and a rapid-fire gun. The chassis was also to be used for cargo and troop carriers. The first prototype built by Daimler-Motoren-Gesellschaft made its first trials on April 30, 1917, at Belin Marienfeld. The final prototype was ready by May 1917. It was unarmored but filled with 10-tons of ballast to simulate the weight. After successful trials in Mainz, the design was modified once more to incorporate two more machine-guns and a better observation post. Pre-production started in September 1917. Production started in October with an initial order of 100 units and a training unit was formed in the process. By then, this machine was known after its studying department, the 7 Abteilung, Verkehrswesen (A7V), “Sturmpanzerkraftwagen” meaning “assault armored motor vehicle”. When the A7V was first introduced in the two first operational units, Assault Tank Units 1 and 2, it had already revealed some flaws, notably the relatively thin underbelly and roof (10 mm/0.39 in), not able to resist fragmentation grenades. The overall use of regular steel and not an armored compound, for production reasons, meant that the effectiveness of the 30-20 mm plating was reduced. Like contemporary tanks, it was vulnerable to artillery fire. It was overcrowded. With seventeen men and an officer, the crew comprised a driver, a mechanic, a mechanic/signaler and twelve infantrymen, gun servants and machine-gun servants (six loaders and six gunners). Of course, the restricted interior wasn’t compartmented, the engine was situated right at the center, diffusing its noise and toxic fumes. The Holt track, using vertical springs, was hampered by the overall weight of the tall structure and its very low ground clearance and large overhang at the front meant very poor crossing capabilities on a heavily cratered and muddy terrain. With this limitation in mind, these first two units (ten tanks each) were deployed on relatively flat grounds. The amount of ammunition carried was considerable, further reducing the internal space. Around 50-60 cartridge belts, each with 250 bullets, plus 180 rounds for the main gun, split between special HE explosive rounds, canisters and regular rounds. In operation more shells were loaded, up to 300. During operations, a single tank was converted as a “female” with two Maxim machine guns replacing the main gun. As initially no engine was powerful enough to move the 30 tons of the A7V in the restricted allocated space, two Daimler petrol 4-cylinder engines, each delivering about 100 bhp (75 kW), were coupled together. This solution produced the most powerful tank of the war, with a speed even greater than British late tanks (Mk.V). 500 liters of fuel were stored to feed this engine, but due to the enormous consumption, the range never exceeded 60 km (37.3 mi) on road. Top speed off-road was limited to 5 km/h (3.1 mph) at best. The driver had very poor vision. The A7V was committed mostly on open terrains and roads, just like armored cars, were its speed and armament could reveal its true potential. Last but not least, the A7Vs were all hand-built and of great manufacture quality (and very high cost). Every model had unique features as no standardization was achieved. The first five squads of A7Vs from the 1st Assault Tank Unit were ready by March 1918. Led by Haumptann Greiff, this unit was deployed during the attack on the St Quentin canal, part of the German spring offensive. Two broke down but successfully repelled a localized British counter-attack. On April 24, 1918, however, during the Second Battle of Villers-Bretonneux, three A7V leading an infantry attack met three British Mark IVs, a male and two females. As the two females, damaged, were unsuccessful in damaging the German tanks with their machine-guns, they withdrew, and left the leading male (Second Lieutenant Frank Mitchell) dealing with the leading A7V (Second Lieutenant Wilhelm Biltz), in what was to become the first tank-to-tank duel in history. However, after three successful hits, the A7V was knocked-out and the crew (with five dead and several casualties) promptly bailed out. The disabled tank was recovered and repaired later. The victorious Mark IV roamed the German lines, creating havoc and was joined later by several Whippets. But after murderous mortar fire, this attack was stopped in its tracks. Three Whippets were destroyed, as well as the Mark IV. This attack included all available A7Vs, but some broke down, other toppled into holes and were captured by British and Australian troops. The entire attack was deemed a failure, and the A7V removed from active service. The 100 machines order was cancelled and several were scrapped in November. The commitment of all available tanks with poor results increased the resistance from the German high command. Some successes were achieved by the most numerous German tank in service during the spring offensives, the Beutepanzer Mark IV and V. Almost 50 captured British Mark IVs or Vs were pressed into service under German markings and camouflage. They showed the advantage of full-length tracks over difficult terrains. They influenced, along with the few captured Whippets Mark A light tanks, the design a new enhanced model, the A7V-U. U stands for “Umlaufende Ketten” or full-length tracks, a German-made but British-looking rhomboid tank. Its featured two 57 mm (2.24 in) guns in sponsons and had a tall observation post similar to the A7V. Although the prototype was ready by June 1918, this 40-ton monster proved to have a high center of gravity and poor maneuverability. However twenty were ordered in September. None were completed by the armistice. All other paper projects (Oberschlesien), mockups (K-Wagen) and prototypes of the light LK-I and II also laid unfinished in November 1918. Starting late in the war, the Germans never had the opportunity to fully develop their tank arm both tactically and technically. This was achieved, mostly clandestinely, but successfully, during the twenties and early thirties. Nevertheless this early and deceiving attempt was a landmark in German development. 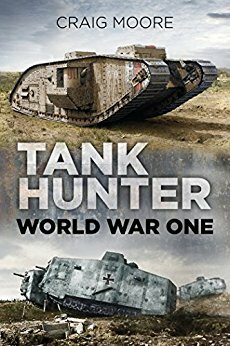 The only German tank to ever roam the battlefields of France and Belgium during WWI was nicknamed by the British the “moving fortress”. Big, tall and symmetrical, with sloped armor, surprisingly fast, bristling with machine-guns, it was indeed more akin to a moving fortification than a real tank. As it was basically an “armored box” based on the Holt chassis its crossing abilities were far from equal to the contemporary British Mark IV or V. With only 20 built of the 100 initially ordered, it was more a propaganda tool than an effective breakthrough apparatus. 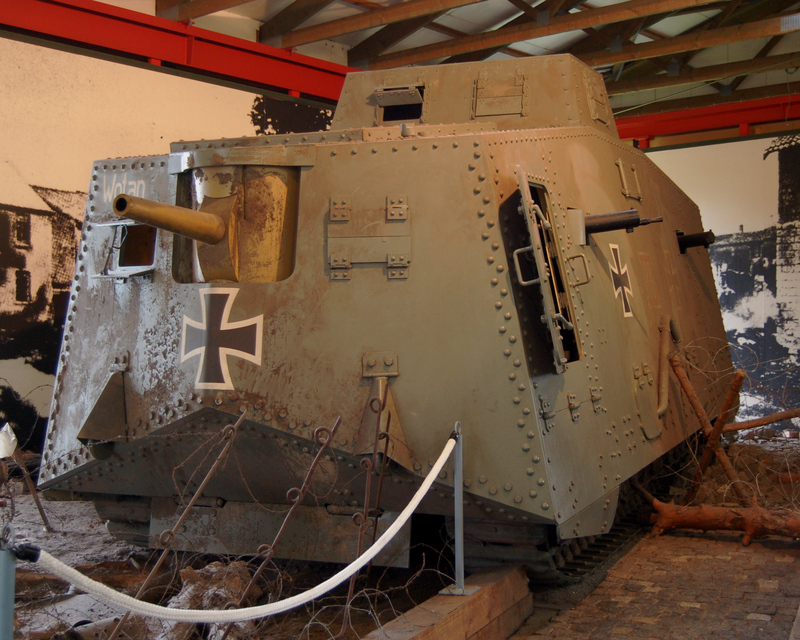 A7V replica on display at the Munster Panzer Museum. All A7Vs were christened by their crews. The “Nixe” for example took part in the famous duel at Villers Bretyonneux, in March 1918. The “Mephisto” was captured on the same day by Australian troops. It is now displayed at Brisbane Anzac museum. Other tanks were named “Gretchen”, “Faust”, “Schnuck”, “Baden I”, “Mephisto”, “Cyklop/Imperator”, “Siegfried”, “Alter Fritz”, “Lotti”, “Hagen”, “Nixe II”, “Heiland”, “Elfriede”, “Bulle/Adalbert”, “Nixe”, “Herkules”, “Wotan”, and “Prinz Oskar”. An A7V at Royes, during the spring offensives, March 1918. 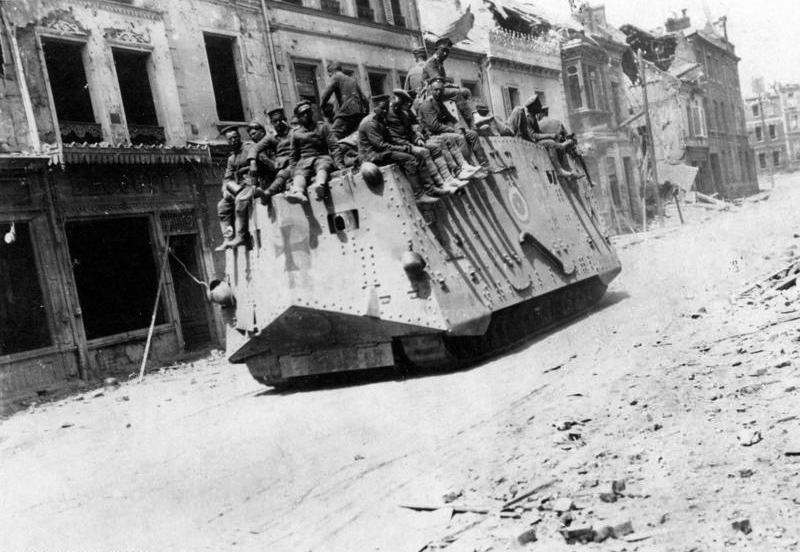 The StPzw A7V number four, one of the five tanks under command of Hauptmann Greiff committed to the attack of St. Quentin canal (British sector), part of the March 1918 offensive. Does anyone know the exact dimensions of the interior of this tank? Thank you. Could you perhaps be more specific in terms of what, precisely, it is you need measurements of? As i’m sure you know, interior measurements are quite a tricky thing to get. Perhaps you could try contacting the Australian War Memorial at Canberra, who currently have Mephisto (the only surviving A7V) on display if they have such figures available? Any of the people involved in its restoration might be able to help. The same can be said for your request on the Tank Mark I page. Perhaps Bovington Tank Museum might be of some assistance? Alternatively, you could try taking a cutaway drawing and, using a point of reference (such as a roller wheel or access hatch), estimate the interior? The image of the A7V stuck in a trench has been debunked as edited–it’s not real. Factory 30 united tanks, send 20 united utilizads. There are several very good publications on A7V and you are using Wikipedia as your source? May I offer to do some of the graphics design of this website? I notice some of it is out of date, and I do it for a hobby. I would not request anything in return. I also know HTML/CSS, if that helps. John, I have been trying to get a hold of you for quite a while now! You have 2 emails from us! If you wish, however, I may ask more formally through the contact me section. We have sent you an email, but seem to get no response. Whats this thing got under the hood? Two inline Daimler-Benz petrol engines cranking out 200 bhp. They were mounted centrally under the ‘cab’. Thank You, I was just interested. The “Mephisto” tank is now physically inside the Queensland Museum again but within the yet to be finished “ANZAC Gallery” – it is to be opened to the public some time later this year (2018) when the gallery is completed. “Mephisto” had to be moved in during the reconstructtion stage so that new walls could be built around it. Anyone know what the Allies were shooting at it? Ie. the “A.P.X. bullet”? It is possible the report is referring to one of the Lebel rifle cartridges, although more investigations are needed! This cartridge was also used for machine-guns such as the Vickers. Thanks…the report was apparently done by the French (the version in the link is an AEF translation)…so Lebel makes sense from that aspect. I did some digging and I think I’ve got this one figured out, I think the APX bullets in question are British .303. All British .303 casings were marked with a headstamp indicating the manufacturer and the type/variant of ammunition and/or propellant loaded into the case. According to this list of manufacturer designations APX stands for ‘Atelier de Construction de Puteaux’, a french munitions factory known to have produced .303 ammunition, including Armour Piercing ammunition. Great find! An AP round makes sense. I would hope the Germans made the A7V so that standard rifle / MG rounds could not piece the sides and vision flaps.